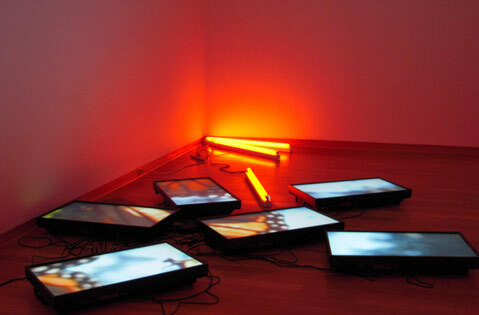 Diana Thater's "Untitled Videowall (Butterflies)" (2008). This show-another in a series of strong efforts by Santa Barbara Museum of Art modern and contemporary art curator Julie Joyce-debuts a recent acquisition with an important connection to the Santa Barbara region’s unusual microclimate. Diana Thater’s “Untitled Videowall (Butterflies)” (2008) is a video installation that recognizes and amplifies the distinctive otherness of the Monarch butterfly, a seasonal migratory visitor to the Coronado Butterfly Preserve in Goleta. Across the hall is Thater’s “Perfect Devotion Two” (2005), a projection featuring a trio of tigers living at the Shambala Preserve big-cat rescue center in Acton, California. That’s right, butterflies and tigers; but this is a museum of art, not the nature channel. Thater describes her artistic metier as “Neo-Structuralist Installation,” shorthand for her ongoing exploration of the boundaries between art and nature, technology and culture, and humans and the other sentient beings with whom they share the planet. For an idea of how to enjoy these at once accessible and densely layered artworks in their art world context, imagine that Thater is methodically exposing not only everything in nature that can be seen by the technologically aided human eye, but also what is hidden or erased by the field of representation. “Untitled Videowall (Butterflies)” sets an incomplete grid (six monitors out of an original square of nine) carrying broken, close-up video images of Monarch butterflies. Splayed across the floor and facing up through red-saturated light, the monitors mimic the plight of the Monarchs in their Michoac¡n winter homes, where deforestation has forced them to adapt by nesting on the ground. The pacing and editing of the footage avoids the didactic in favor of a meditative and mediated experience that lends itself to thoughtful engagement at a distance rather than purposeful, direct interaction. “Perfect Devotion Two” further unravels the same frayed edge of the representation of nature, with long takes, unshielded crane shots, and a randomized approach to shooting in the Shambala tiger enclosure. The resulting film seems to play with some very big kitties. It’s a fascinating piece of what Thater calls her “choreography,” a strategy that puts artist and tiger into a dancing dialogue. From any perspective, the performance amazes.